Not too long ago I reviewed the first book in the Jake & Laura Mystery series, The Yankee Club, and gave it a rare full five stars rating. 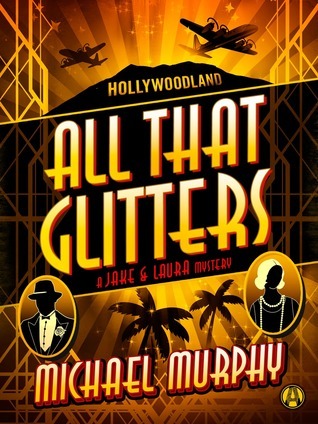 All That Glitters is author Michael Murphy’s follow-up, with the story picking up right on the heels of The Yankee Club‘s ending. In this venture, Jake & Laura are headed to Hollywood, where Laura has been offered a leading role in a new film at a company run by a domineering family. Jake’s prowess as a writer (of ‘Blackie Doyle’ mystery novels) precedes him and he is asked to help fix the script for the film Laura will be featured in. Jake is hesitant to get involved, not wanting to possibly derail her future in film, but the studio’s head won’t take no for an answer. After an argument (that comes to blows) with the original screenwriter (a son of the head of the company), the writer is found dead of an apparent suicide. When Jake proves it wasn’t a suicide, the most likely candidate to have murdered the man, is Jake! Jake then has only a few days to prove his innocence. The search takes Jake through some of the finer parts of the glamorous life and acquaints him with some of the seedier parts of mob life. Just as in the first book, author Murphy sprinkles in a few authentic, recognizable people. These famous Hollywood figures are fun to meet and Murphy manages to keep them true to the Hollywood history books but their connections to Jake and Laura are completely believable as well. These real-life historical figures are a great way to spice up a Prohibition Era mystery series! Although it is definitely my personal bias, I have to admit I enjoyed Jake and Laura’s adventures in New York just a little more, but then I have more of a history and passion for theatre than I do for film. However, this fun, fictional look at the ‘glory days’ of Hollywood definitely has appeal. Jake and Laura’s relationship is a huge part of the fun of this series so far and their growth here is perfect. It does grow, and yet it leaves us wanting more. In fact…everything about this book leaves me wanting more. In a good way! Jake gets into scrapes the way only a 1930’s former Pinkerton-turned-novelist can! And with Laura’s connections to the wealthy and famous both will be hobnobbing in all sorts of places. I felt that Laura took a stronger hand in this book, and it shows that she’s more than capable of holding her own alongside the tough Jake Donovan. I liked this book. I liked it a lot and of the various mystery books and mystery series’ that I’ve read, this is far and away my favorite. I can’t wait for more. Looking for a good book? All That Glitters is gold. Thanks so much for taking the time to read and post your review. Glad you’re enjoying the journey of Jake and Laura. All That Glitters will be released January 6. I’m putting the finishing touches on book three in the series, Wings in the Dark. You might get a hint of that story line from the ending of All That Glitters. Keep ’em coming! I love these books!